Every day it seems Pres. Trump is saying something new about his position on the DACA (Deferred Action Childhood Arrivals) program. It is clear that his Attorney General Jeff Sessions made an announcement the Trump Administration plans on ending DACA in six months. In the United States, we now have nearly 800,000 DREAMers in the County that lives are in danger of being completely uprooted. We have 3,371 Nebraskans that are DREAMers, they have friends, family, jobs, memories, and futures here, that are now in danger. We stand with DREAMers. As Democrats we believe diversity makes us stronger. 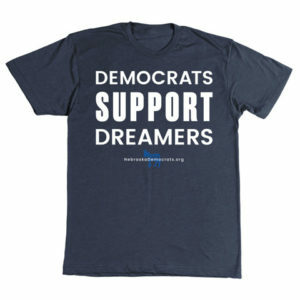 We support DREAMers they are our friends, neighbors, classmates, co-workers and our inspiration of working for a better life. 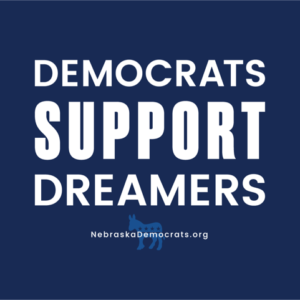 As the Democratic Party, we support Dreamers and electing more Latino Democrats so their voices and ideas are at the table making the laws that impact families and young people. -If You Do Not Have DACA or a DACA Application Pending – You no longer can apply. -If You Have DACA That Expires on or Before March 5, 2018. – If you have DACA and a work permit that expires on or before March 5, 2018, you can apply for a 2-year renewal, but your application must be received on or before October 5, 2017. -If You Have DACA That Expires After March 5, 2018. If your DACA and work permit expire after March 5, 2018, you are not eligible for an extension and your DACA, work authorization, and protection from deportation will expire on the date shown on your DACA approval notice and work permit. -If You Have a DACA Application Pending. If you have a DACA application that was received at USCIS on or before September 5, 2017, your application will continue to be processed. -If You Have DACA and a Valid Advance Parole Travel Document. If you have DACA and have a currently valid advance parole document, you may still use the document to travel and return to the U.S. as long as you return BEFORE the document expires. However, even with a valid travel document, CBP can still refuse to let you in. Before you travel, speak to a qualified immigration lawyer. -If You Have an Advance Parole Travel Document Application Pending. USCIS will no longer process or approve applications for advance parole for DACA recipients. If you have an application for DACA-based advance parole pending as of September 5, 2017, USCIS will close the application and return the filing fees to you. -Your DACA Can Be Terminated at Any Time. Even with valid DACA and a valid work permit, the government can terminate your DACA and work permit at any time if it believes you are no longer eligible or for any other reason. -If you have questions talk to an immigration lawyer as soon as possible. -Do Not Talk to a Notario. Notarios are not lawyers and are not trained to fully understand the complex U.S. immigration system. -DREAMERS and Allies Don’t Give Up. Congress can pass a bill to offer a permanent way for those with DACA to stay in the United States. Call and tell Congress to stand up for Dreamers! Thank you to the current elected Latinos in our state: State Senator Tony Vargas, MCC Chair Roger Garcia, OPS School Board Member Amanda Ryan, Lincoln Airport Authority Board Member Zachary Mora James, Papio Missouri River Natural Resources District Board Member Larry Bradley, Schuyler School Board Mynor Hernandez, Western Community College Board Member Linda Guzman-Gonzales, Scottsbluff City Council Member Ray Gonzales, Dakota County Commission Member Tony Gomez, and South Sioux City Council Member Oscar Gomez.